China, Russia and India on Wednesday agreed to enhance coordination and cooperation, firmly uphold multilateralism and jointly fight against terrorism. 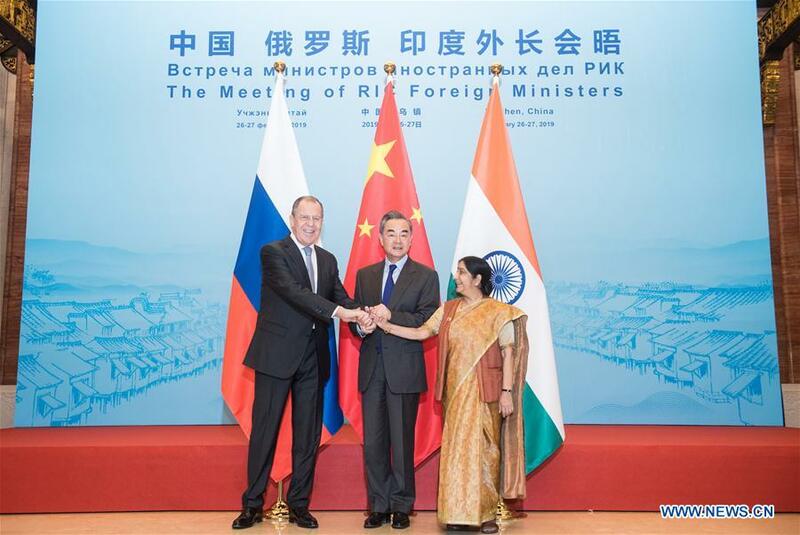 The agreement came as Chinese State Councilor and Foreign Minister Wang Yi, Russian Foreign Minister Sergei Lavrov and Indian External Affairs Minister Sushma Swaraj held the 16th meeting of the foreign ministers of China, Russia and India in Wuzhen, eastern China’s Zhejiang Province. The three sides also agreed to constantly consolidate and expand trilateral practical cooperation, and work on setting up a meeting mechanism among their defense ministers in an appropriate time. China also proposed to discuss “China, Russia, India plus” cooperation, so as to improve global influence of the trilateral cooperation.